For the class "Special Topics in BIM" that I am taking this semester, I designed the BIM of a commercial building using Revit 2010. Designing a building in 3D was not that easy ever. 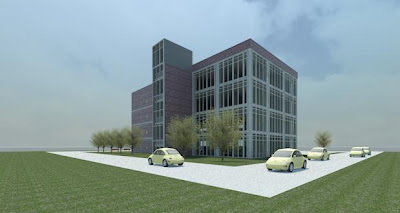 Getting 3D views, sections, plans and elevations were the matter of seconds using Revit Architecture 2010. 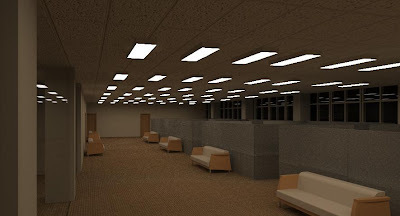 Revit's parametric modeling capabilities helped me improve my design very early in the project. I am planning to use Revit's parametric capabilities to map the operations phase of the project. For this I will be using export and import of Revit data and project operations data respectively. The idea is to make planning and scheduling more predictable by mapping very minute details of the operations phase and using it to make the system more effective and efficient. This project is a pilot for future developments on this idea. I will be updating the progress as I move ahead with the project. Following are some renderings of the current model. In these fast-changing times it is imperative we have measurement around whether green building choices both provide a very high return on investment and a significant decrease in our environmental impact. This webinar effectively demonstrates LEED certified green building accomplishes these goals while outlining next steps for LEED certification to further contribute to reducing the environmental footprint of buildings in the U.S. and worldwide. During this 60 minute webinar a sneak-preview of the Green Building Market & Impact Report will be presented by the report’s author Robert Watson, GreenerBuildings.com Editor and industry leader. This report is an integrated assessment of the land, water, energy, material and indoor environmental impacts of the LEED for New Construction (LEED NC), Core & Shell (LEED CS) and Existing Building (LEED EB) standards. JohnsonDiversey President & CEO Ed Lonergan will also highlight the importance of sustainability in today’s business environment, offering insights and examples of the company’s work toward improving the sustainability of its customers’ facilities as well as its own. This presentation will detail JohnsonDiversey’s own focus on LEED certification for many of its facilities worldwide. I look forward to connecting with you. If you have any questions, please do not hesitate to ask!